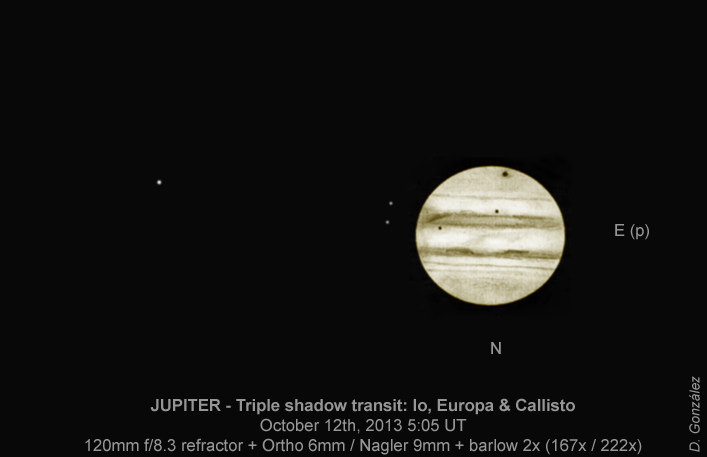 On October 12th good weather allowed me to see the rare triple shadow transit on Jupiter, and in addition seeing was excellent. Callisto’s shadow was big and somewhat fuzzy, near the south pole, while Io’s and Europa’s were tiny and sharp, at both sides of the SEB. It was very interesting to see all three shadows move across the planet for one hour! The sketch corresponds approximately to the middle of the event. Wow, isn’t it a picture? I was so excited even with one show transit. I cannot imagine how it would be…. Beautiful sketch. Excellent. Thanks for sharing good sketch and you wonderful experience. Thank you for sharing your excellent sketch. I missed it in my area and was glad to see what it appeared as. A most impressive sketch of Jupiter all the better with the transits. Thank you all for your comments! I certainly was very lucky with weather and seeing for this event.